Hexes have a cartographic advantage over grids in that the center of a hex is equidistant from the centers all six adjacent hexes. In contrast, on a standard graph paper grid diagonal movement is more efficient than moving in a cardinal direction, assuming a destination other than cardinal-adjacent (that is, other than due north, due south, due east, or due west). 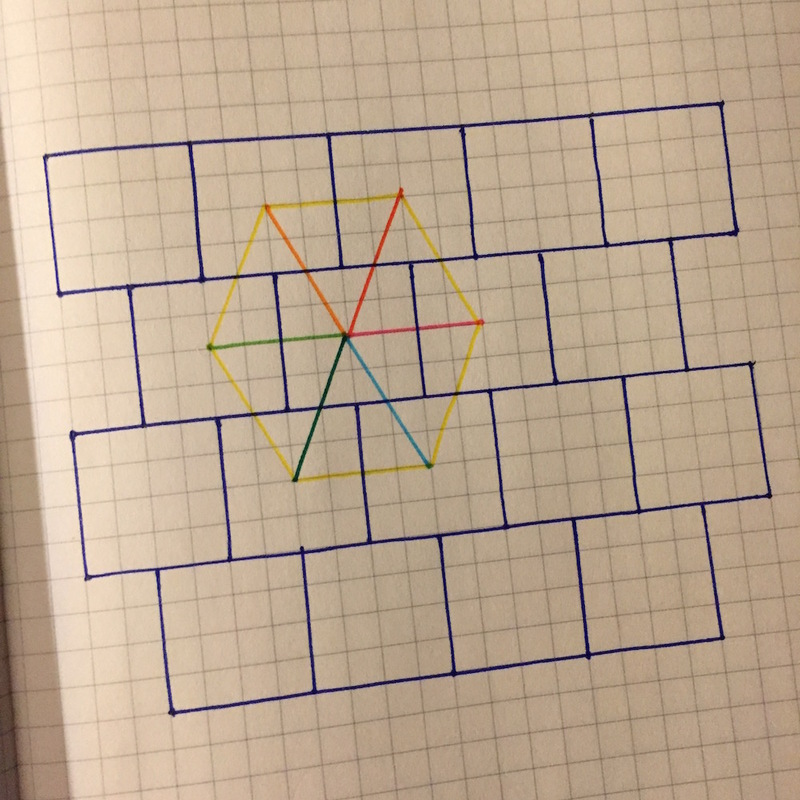 Recently I noticed that squares in a brick configuration are topologically similar to hexes in terms of adjacency. Each brick is adjacent to six surrounding bricks. Bricks, however, are much easier to sketch than hexes. To see another way how bricks are similar to hexes, consider the following image and imagine the orange brick overlay moving right until the center of the bricks is superimposed over the center of the hexes. This entry was posted in Techniques and tagged wilderness on November 21, 2017 by Necropraxis. Not that I’m under the delusion that anyone that reads my blog doesn’t also read Zak’s, but I still feel compelled to post about this. 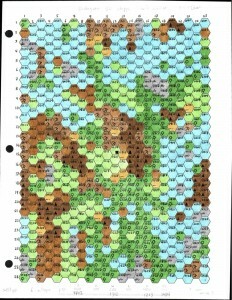 Zak found this old hex map I put up but never used. I created it using the procedures from Victor Raymond‘s Wilderness Architect (which can also be found as a pair of articles in Fight On!, issues two and three). He then prompted arbitrary people on Google Plus to stock it, democratic-like. The result can be found here (Google Docs spreadsheet) thanks, I gather, to Random Wizard. That’s right, almost every single hex has something interesting (that’s more than 600 keyed hexes). The Hexenbracken was created hex-by-hex over the last few days by a ton of people on Google + and Despite a certain amount of democratic noise that you’d expect from anything like this, I can say with my hand on my heart that it has a smaller percentage of stupid things in it than any other hexcrawl product I can think of. The map, by the way, is in the public domain. This entry was posted in Spotlight and tagged wilderness on March 30, 2013 by Necropraxis. They assume the 3E skill system, but are still interesting reads. For comparison, see my old wilderness movement costs post (which is really just a slightly simplified version of the B/X wilderness movement system). In particular, his concept of “watch” seems like higher temporal resolution than I need. What I have been doing is one encounter check per day (with a die roll to determine time of day). This is pretty much as specified by the original Expert rulebook. 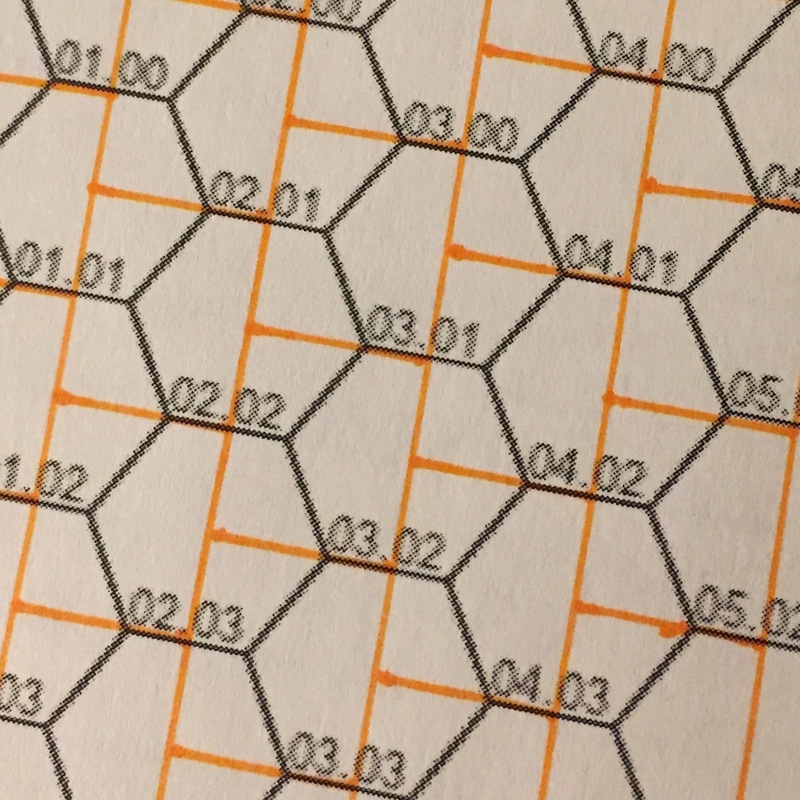 There are also rules for discovering fixed features through exploring hexes rather than moving through them (like searching a room for secret doors in a dungeon). It is also possible to notice some fixed features without searching form them. If you find yourself starting to worry about where the PCs are “in the hex”, you’re doing it wrong. I need to think about that more. Should the hex be an atomic measure of wilderness space? It has a pleasing absolutism to it. 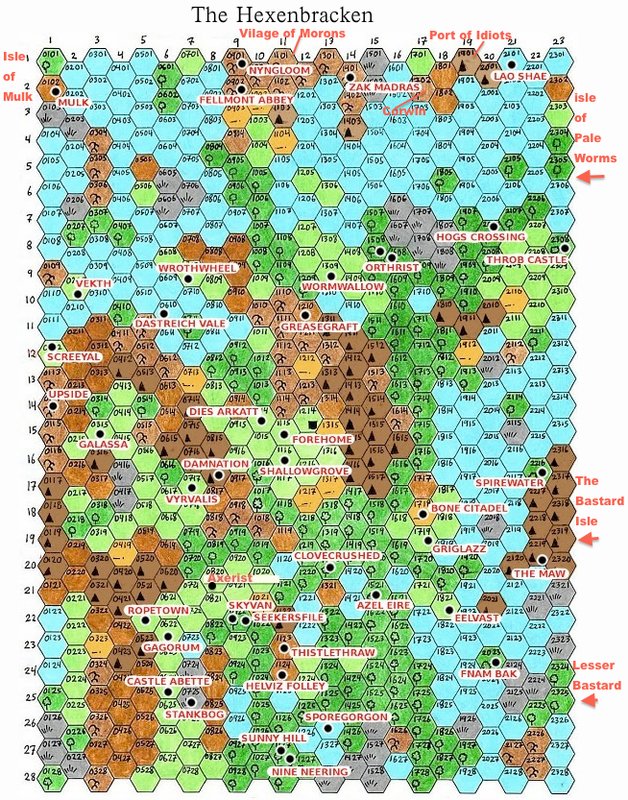 It does remove the idea of zooming hex levels, but perhaps that is unnecessary complexity anyways. This entry was posted in Spotlight and tagged wilderness on June 20, 2012 by Necropraxis. 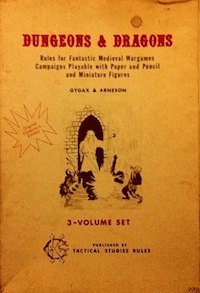 One of the major draws of a sandbox campaign is that players get to choose their own paths. But in order to make informed choices, players need setting information. There are two major ways of communicating such information: 1) setting documentation and 2) learning about the setting through play. Option 1 is also known as the infodump; published setting canon belongs to this category. Unsurprisingly, I favor the second method, but it does sort of beg the question: if you need info to play intelligently, and you gain info only by playing, does that mean that you must play stupidly to begin with? You could take a hybrid approach, which I suspect is actually the most popular in the wild. Something like: read this small infodump, and then learn the rest through play. And I’m certainly not against some amount of background info (though it does have the tendency to grow once unleashed). However, under the principle of restricting preparation to elements likely to affect the game directly, there is a traditional structure that can be used: the rumor table. It seems to me like we already have an integrated rumor table without any extra work required: the stocked hexes. You just need an impartial way of deciding which areas you want rumors to be about, and (optionally) their truthfulness. I’m not sure that much actual utility is gained by seeding false rumors (as is usually done in old modules), but it is easy enough to roll for truth if you so desire (maybe 1 in 6 rumors are false or misleading). Here is the method I am considering. Optionally, in the case that a 6 is rolled for both farther hex and distance, you can have the possibility of a rumor from even farther afield. Here is one way to do this. Roll a d6 to “confirm” the far-distance rumor, and then another d6 for the actual distance and add it to the previous distance. Continue this process as long as you roll 6s on distance rolls. Or stop at the edge of your stocked hexes. When PCs enter a hex, roll for one rumor automatically, no matter what the characters do. This information may be conveyed in any way you like, via encounter, dream, whatever. These may be framed in whatever way works best for your particular group (some ideas include: leads, quests, and direct encounters). I imagine the appropriate number of leads will vary by group. Additional rumors can be uncovered by PC action. Maybe roll d6 more times, and maybe adjust that result by charisma or intelligence as appropriate to the context. For example, if the PCs are in a tavern, charisma is probably more relevant, but library research might use intelligence. Rumor roll: 3. Select a rumor from the current hex. Rumor roll: 4. Adjacent hex. Roll for direction: 3 (southeast). Rumor roll: 6. Farther. Roll for direction: 2 (northeast). Roll for distance: 6. Roll for even farther: 6. Roll for additional distance: 3. So, the rumor should be taken from 9 hexes away to the northeast. In a separate G+ conversation about encounter tables, a similar method (but for random encounters) was brought to my attention (I had seen that one page dungeon before, but didn’t notice the random encounter method). See here too. This seems like a nifty way of doing encounters too, and I’ll probably consider it more when I get to the post on random encounter tables. This entry was posted in Uncategorized and tagged wilderness on June 14, 2012 by Necropraxis. 1-2 lair, 3 hazard, 4 special, 5-6 empty. What are these things? They are subtly different than the dungeon equivalents, so here are some definitions. Lair: a place where monsters reside. Probably counts as a small dungeon, and may sometimes connect to the underworld. Examples: goblin caves, bandit fort, zombie graveyard. Hazard: something that is potentially dangerous, but only if PCs interact with it. Examples: lava flow, quicksand, time-stopped wizards mid-duel, town where everyone was killed by a disease, magical radiation. Special: something with interesting utility, unlikely to be directly dangerous (though don’t underestimate the power of creative players to make anything dangerous). 50% chance that a special is a settlement. I wish I had a better word than special for this category. Non-settlement examples: wizard’s tower, oasis, dimensional gateway, healing spring, antigravity zone. Impossible to miss: if you enter the hex, you are aware of it. If you are following roads, then anything on the road is of this category. Examples: a mile high tower on a flat plain, the smoke from an army’s campfires, New York City (probably doesn’t fit in a 6 mile hex, but you get the idea). Standard: some chance in 6 of discovery. If you’re just trying to move through a hex, you still get a passive chance of discovery. Less: some chance in 6 of discovery, and you must proactively spend time exploring the hex. Least: like above, but lower chance of discovery. This “obviousness” hierarchy is still something I’m working on. The similarity to secret door systems is not lost on me, but I haven’t decided exactly how it should best be systematized yet. I also feel like I read something similar to this somewhere, but I’m not sure where. Also, in case it’s not clear, the default level of obviousness is standard, not impossible to miss. If there are dangerous things (hazards) and interactive things (specials) there should also be a category of things that are interesting but not so interactive, right? Otherwise, I suspect the hazards and specials will start to feel too common, even if you try to improvise other details at the table. Dungeon stocking systems often have the concept of dungeon dressing; thus, we need wilderness dressing too. Since fluff is crunch, the dressing might still be of use to creative PCs too. My first thought for this was an independent roll per hex, with a 2 in 6 or 3 in 6 chance of added dressing. Like the general hex stocking step, keep rolling until you get a negative result. So, the majority of hexes will not have a dressing element, but a few will have more than one. Hopefully this distribution will feel organic and keep players guessing. Examples of wilderness dressing: abandoned farmhouse, small canyon, half-buried dinosaur skeleton, crater from a past explosion. To summarize the system as I see it working now: for each hex, roll 3d6 (each die being a different color would probably be convenient). Die 1 determines the main result (lair, hazard, etc), die 2 determines the treasure, die 3 determines if there is dressing. Die 1 and die 3 are each re-rolled until they come up negative, determining ever more hidden hex features. For each result, the relevant subtable is consulted for details about type. I see these tables as a mixture of generic elements that can repeat and unique Vornheim-like entries that are crossed off and replaced with something else once rolled. Monsters are determined by rolling on a terrain-specific table. Treasures are determined by monster hoard type (if part of a lair result) or the standard dungeon “unattended treasure” table (maybe? I haven’t thought this through yet). In the future, I might do some table consolidation, so that fewer die rolls are needed, but I want to leave the various rolls separate for now to preserve the probabilities and make it clear where results are coming from. Also, I don’t think the number of dice required can by much reduced if I want to support a variable number of features and dressing elements per hex. 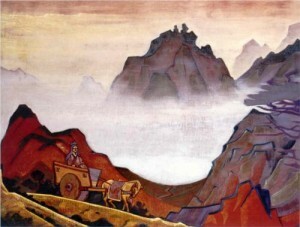 This entry was posted in Uncategorized and tagged wilderness on June 12, 2012 by Necropraxis.